AMBERIAN DAWN is a relatively new band that formed in 2006. The Clouds Of Northland Thunder is their second album, coming only a year after their debut. Hailing from Finland, this five-piece will no doubt draw comparisons to NIGHTWISH in that they have an operatic singer and have a strong classical influence. However, writing AMBERIAN DAWN off as mere NIGHTWISH clones would be unfair. NIGHTWISH gets its classical sound more from the accompanying orchestra, while AMBERIAN DAWN incorporates the classical melodies and song structures directly into the keyboards and the guitar riffs and leads. Lead singer Heidi Parviainen is more operatic than current NIGHTWISH singer Anette Olzon Blyckert, but what really makes her performance outstanding is the level of restraint that she uses. Tarja Turunen would frequently go too over-the-top in her singing and the songs would suffer as a result. The music here is definitely heavier than recent NIGHTWISH output and there are many outstanding leads and solos throughout The Clouds Of Northland Thunder. The biggest surprise here is not just that there are some great songs to be found on The Clouds Of Northland Thunder, but also the level of consistency. The second half of the album is almost as strong as the first half, and there is a noticeable lack of filler. As mentioned before, there is some great guitar-work to be found; the solos are played very fast, but rarely fall into self-indulgence. Unlike some bands in this genre, AMBERIAN DAWN keep their songs succinct and to-the-point. Only one song (barely) eclipses the five minute mark, and this definitely works to their advantage. It's really hard to pick a favorite song, although the male/female vocal in Incubus is definitely a standout, as are the very strong melodies in Shallow Waters and Lost Soul. On the surface, it would seem that this band is very similar to NIGHTWISH, which is indeed true. 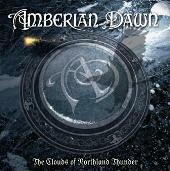 However, AMBERIAN DAWN forges their own sound and never loses their metallic edge. This was one of my biggest surprises of 2009 and comes highly recommended.